Purwo, Linda S. (2001) Peran motivasi pribadi dalam mengatasi drop out program rehabilitasi ketergantungan obat. Skripsi thesis, Universitas Tarumanagara.
" Success or on the other failure in following of substance abuse rehabilitation program is greatly influenced by the patients, motivation to get well. 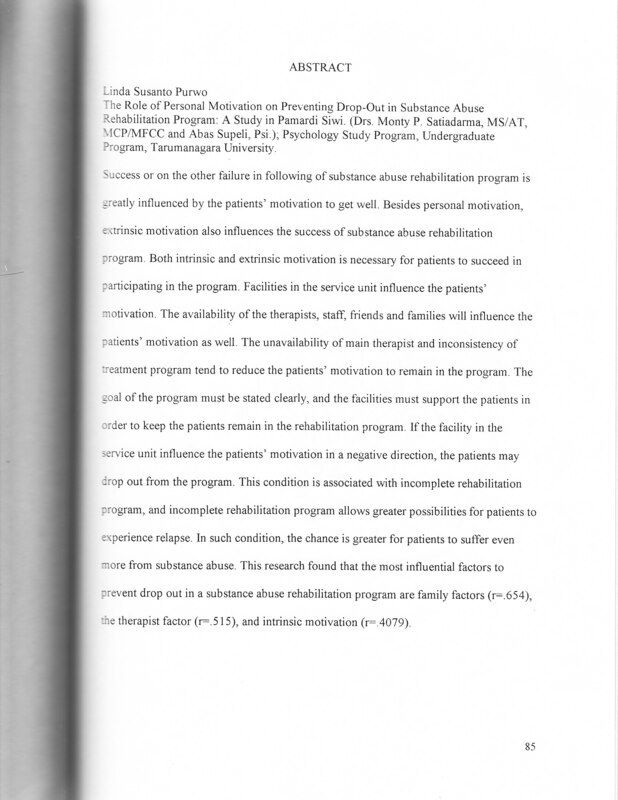 Besides personal motivation, extrinsic motivation also influences the success of sub stance abuse rehabilitation program. Both intrinsic and extrinsic motivation is necessary for patients to succeed in participating in the program. Facilities in the service unit influence the patients” motivation. The availability of the therapists, staff, friends and families will influence the patients” motivation as well. The unavailability of main therapist and inconsistency of treatment program tend to reduce the patients” motivation to remain in the program. The goal of the program must be stated clearly, and the facilities must support the patients in 1 order to keep the patients remain in the rehabilitation program. If the facility in the service unit influence the patients” motivation in a negative direction, the patients may drop out from the program. This condition is associated with incomplete rehabilitation program, and incomplete rehabilitation program allows greater possibilities for patients to experience relapse. In such condition, the chance is greater for patients to suffer even more from sub stance abuse. This research found that the most influential factors to prevent drop out in a sub stance abuse rehabilitation program are family factors (r=.654),he therapist factor (r=.515), and intrinsic motivation (r=.4079). "